Mr. David Miscavige, Chairman of the Board Religious Technology Center and ecclesiastical leader of the Scientology religion, with (left to right) President of the Australian Human Rights Council for Education, Dr. Sev Ozdowski OAM; the Honorable Julie Owens MP; Programs Manager, Young Offenders Support Service, Ms. Kalisi Bese; and Aboriginal Elder of the Dunghutti people, Mr. Bill Allen. The home of the Scientology Ideal Organization of Sydney was originally constructed in 1908 and stands today as a landmark in the city center. The Church preserved the Federation Free Classical style structure, thereby returning its historic features to their original glory. The many architectural details restored by the Church of Scientology include the historic terrazzo stairway and columns which extend three stories of the New South Wales heritage site. On the evening of May 3, more than 2,500 Scientologists from across Australia filled Castlereagh Street to inaugurate the Harbor City’s new Church of Scientology Ideal Organization (Ideal Org). 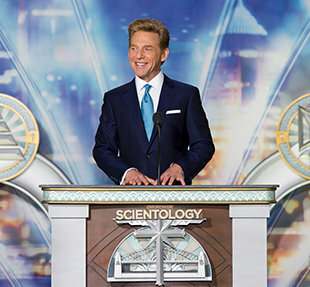 In honor of the historic occasion, the ecclesiastical leader of the Scientology religion and Chairman of the Board Religious Technology Center, Mr. David Miscavige, traveled to Sydney to lead the dedication ceremonies. The Church further completed 21st-century upgrades to the entire structure, as well as the addition of two full stories. As an Ideal Org, the building now accommodates the Church’s ever-growing congregation and serves as a hub for people of all faiths and cultures across New South Wales. National and state dignitaries welcoming the new Church included National Member of Parliament, the Honorable Julie Owens; President of the Australian Human Rights Council for Education and Medal of the Order of Australia recipient, Dr. Sev Ozdowski; Programs Manager, Young Offenders Support Service, Ms. Kalisi Bese; and Aboriginal Elder of the Dunghutti People, Mr. Bill Allen. The Harbor City’s new Ideal Org provides all visitors with an introduction to Dianetics and Scientology, beginning with the Public Information Center. Its displays, containing more than 500 films, present the beliefs and practices of the Scientology religion and the life and legacy of Founder L. Ron Hubbard. The Information Center also offers a detailed overview of the many Church-sponsored humanitarian programs—including a worldwide human rights education initiative; an equally far-reaching drug education, prevention and rehabilitation program; a global network of literacy and learning centers; and the Scientology Volunteer Minister program, now comprising the world’s largest independent relief force. The Center is open morning to night for visitors to tour at their leisure and return as often as they wish. The Church’s Chapel provides for Scientology congregational gatherings, including Sunday Services, Weddings and Naming Ceremonies as well as a host of community-wide events open to members of all denominations. The new Ideal Org further includes multiple seminar rooms and classrooms, in addition to an entire floor dedicated to Scientology auditing (spiritual counseling). The opening of a first-ever Ideal Advanced Organization in the heart of Copenhagen, Denmark—the Ideal Advanced Organization and Saint Hill Europe. And the dedication of an Ideal Pacifica Bridge on L. Ron Hubbard Way in Los Angeles, California; comprising Organizations paralleling the Bridge to Total Freedom.